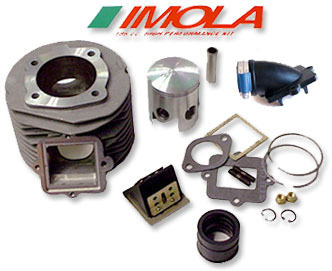 Hot new long stroke kit for maximum torque from your 200cc engine! This new version includes a rubber intake manifold for easy installation and protection to the carburetor from engine vibrations, a reshaped exhaust port for more top end power, and more material around the base of the transfer ports to allow for very large port areas if the engine case is welded up and remachined. For use with with a 62mm long stroke crankshaft (NOT included, order #0220.C62 separately), offering an actual capacity of 238cc and a big boost in low end and midrange power.